Most home soda makers are either soda siphons or small, independent appliances. Soda siphons attach to the mouth of a bottle and carbonate whatever liquid is in the bottle. It does this through a small CO2 cartridge. inserted into the siphon. Soda machines have CO2 cartridges built into what’s usually a counter-top appliance that can fill a bottle. Many will have features that allow you some control, such as how much CO2 goes into the bottle. They’re easier and faster to use, but also more costly up front, and take up a lot more room. Additional benefits to a soda siphon are that they’re easier to store, easier to clean, and there’s less chance that something could go wrong. 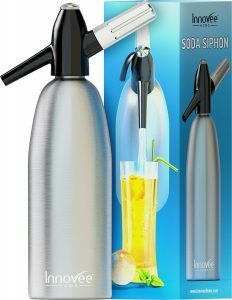 Soda siphons are made for casual drinkers who want the freedom to carbonate what they’re drinking on-demand without a lot of fuss. It also helps to reduce the inconvenience and volume of trash involved when constantly bringing home bottles of soda from the store. Before you buy one for yourself or your family members, it does pay to do your homework. Like any product, there’s a variety of manufacturers, so you should be aware of price, quality, ease of use, and availability of parts and supplies. 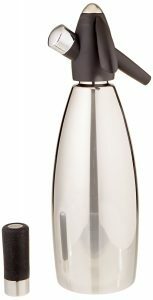 This is a 1-quart ceramic-lined stainless steel bottle with attachable siphon and fits neatly into the overflow regulator valve. The iSi siphon bottle also comes in a smaller size made in a handsome brushed aluminum. Either size can fit neatly into your refrigerator, or look quite impressive on your countertop or home bar. It includes features such as a measuring tube and pressure control valve to prevent unexpected spills. All the parts are well-made in Austria, and not China, for a quality carbonator that can’t be beat for the price. Overall, the iSi soda siphon is quite impressive in its quality and performance, probably one of the best you’ll find. A bit pricier than most, but worth it. You should get a lifetime of service from this product without any major issues. You can buy soda syrups, mix and match to create your own tastes, carbonate fruit juices, or create a great club soda with just water, a pinch of salt and baking soda, and a dash of lime juice. If you’re a soda – or cocktail – drinker who’s constantly lugging home two-liter bottles of soda, you’ll love the convenience and versatility of your own soda siphon. The iSi comes with an instruction booklet you’ll want to read to get the best results, but be prepared to experiment a little to get exactly the volume and level of carbonation you like. The quality of the “fizz” isn’t too impressive unless the iSi siphon bottle is properly used. That means keeping both the iSi soda siphon and the liquid VERY COLD, and it definitely helps to give it a good shake after adding the CO2. Be sure to take these steps and the result will be perfectly satisfactory. Those who like extra fizz in their drinks might go so far as to use more cartridges or even buy a separate larger tank of Co2; just be sure to get the food-grade products. However, this can be a lot of pressure which may actually damage the iSi siphon. Understand that the water can only absorb so much gas. But as it is, if the siphon is used properly and everything is kept refrigerated, your drinks should stay fizzy overnight if not for a day or two. This is a great, durable product that does allow you a lot of creative flexibility in your drinks. You’ll have to buy 8-gram iSi CO2 chargers separately to get started, but many alternative brands will work just as well. Your cost per-quart will be lower if you buy the cartridges in bulk. This item has a 1-liter capacity, but can also be used by the pint when you’re less thirsty. It’s made of durable aluminum and comes with an illustrated instruction manual and recipe book to get you off to a quick start and give you some idea of the range of custom but healthy drinks you can easily create. You can also find tips on YouTube. The handsome design includes a pressure regulator and no-spill threaded bottle lid. The bottle itself is safe to use in the dishwasher for easy cleaning. This article doesn’t come with CO2 chargers, either. The cartridges are on the expensive side and rather small, but the siphon bottle will accept most after-market cartridges of different sizes. The Professional Soda fountain is well designed and works efficiently for its price range, better than some more costly models. Almost no CO2 is wasted with proper use, and nothing is left over in the bottle after pouring. These are common problems with the cheaper types of carbonator designed to screw directly onto a plastic bottle. The Professional siphon is so easy to use that you might even want to get one for the kids so they can prepare their own, healthier, carbonated drinks instead of sodas. And they’ll have a little fun in the process! The recipe book is impressive and opens up a lot of possibilities you may never have thought of. Buying big bottles of club soda for your home bar means they usually go flat after only a little use, whereas with the Professional soda siphon you’ve got a liter of quality sparkling soda whenever you need it, and it will stay carbonated for days. You can also use the siphon to re-carbonate store-bought sodas that go flat, which may pay for itself if you drink a lot of soda. 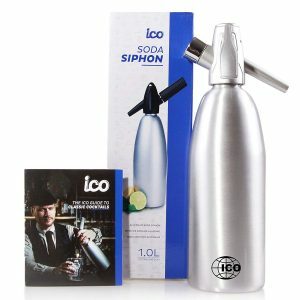 The Professional Soda Siphon is made by ICO, which has an excellent reputation for standing behind its products. On the whole, it’s a dependable product at an excellent price. The Innovee siphon is a comparable product with a sleek-looking 1-liter aluminum bottle. It’s dishwasher safe and uses any standard 8-gram CO2 cartridge. All the parts appear to be well-made and long-lasting. You can get a downloadable eBook with recipes and instructions. If you can find the right size NO2 cartridges, you can also make flavored whipped cream right in the same bottle. A few users have also reported making carbonated wine coolers with great results! On the downside there is no pressure adjustment, you use a single, entire cartridge, and it can take 15 minutes for the liquid to fully carbonate. Otherwise, it won’t dispense smoothly. That’s not a big deal if you think ahead, though, and it retains the fizziness longer than some other models. One of the best aspects to buying an Innovee is that you can get replacement parts for any that eventually wear out, such as O-ring seals or CO2 charger holders, as well as a key for disassembling and removing such pieces. Keep a few of these inexpensive items on hand and you’ll never have to buy another soda siphon. With the Innovee, you can easily and quickly make about 3 cans’ worth of soda per bottle, exactly the way you want it, whenever you need it. No need to worry about taking home, storing, or disposing of multiple aluminum cans or plastic bottles. Hopefully Innovee will come up with an even larger size! Attach the CO2 charger as the very last step. Otherwise, you’ll lose the fizz and wind up with flat soda. One of the better aspects of it’s design, however, is that the soda won’t flow from the siphon if there’s no CO2 pressure, so you’ll know right away if you did something wrong. Many happy users also recommend giving the siphon bottle a shake before each pour; this in is one of the secrets to a perfect sparkling water mix every time. Another limitation with the Innovee is that there is no easy way to determine the liquid level, so you’ll have to measure out beforehand to avoid errors. You might also want to avoid adding any acidic fruit juices that might react with the aluminum to the serving glass instead of the siphon bottle. For preparing sparkling water that you can add to any beverage or mix, the Innovee works as advertised. All it takes is a little practice and common sense, and you’ll be very happy with this product. With a good soda siphon, you’ll find that making your own carbonated drinks is fun, healthy, and easy!